North Carolina's Civil War stories are as diverse as its landscape. The Outer Banks and coastal rivers saw action early in the war, as Union forces occupied the region. Stories abound of naval battles, blockade running, Federal raids, and the Confederacy's struggle to supply its armies. Other tales are told in the western mountains, a sometimes-lawless region where Unionists and Confederates fought a war within a war. In the rolling central piedmont, memories linger of Union Gen. William T. Sherman's relentless march north early in the spring of 1865, when his army defeated the Confederates under Gen. Joseph E. Johnston. Finally, on April 26, Johnston surrendered, essentially ending the Civil War. Marker is on the left. Photo originally uploaded to the 'Third Confederate Defensive Line' marker. Location. 35° 15.981′ N, 78° 40.318′ W. Marker is near Godwin, North Carolina, in Harnett County. Marker is on Burnett Road (State Highway 82) south of Arrowhead Road, on the left when traveling north. Touch for map. 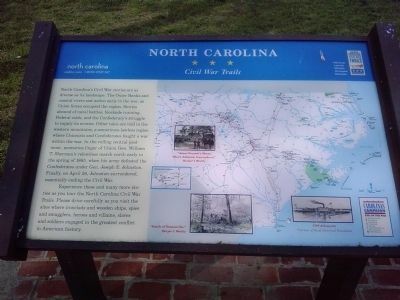 Marker is located near the parking lot of the Averasboro Battlefield Museum, next to the NC CW Trails marker for the 'Third Confederate Defensive Line'. Marker is in this post office area: Godwin NC 28344, United States of America. Touch for directions. Other nearby markers. At least 8 other markers are within walking distance of this marker. 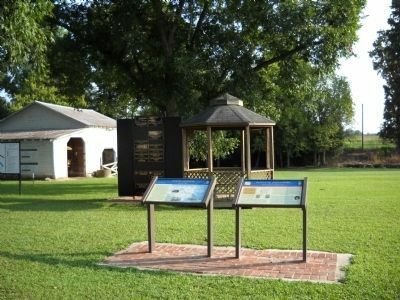 Averasboro Battlefield Museum (a few steps from this marker); Battle of Averasboro (a few steps from this marker); Union Headquarters (approx. 0.2 miles away); Chicora Cemetery (approx. 0.2 miles away); Men of South Carolina (approx. 0.2 miles away); a different marker also named Battle of Averasboro (approx. 0.2 miles away); Confederate Soldiers of McLaws Division (approx. 0.2 miles away); South Carolina Troops at Battle of Averasboro, NC (approx. 0.2 miles away). 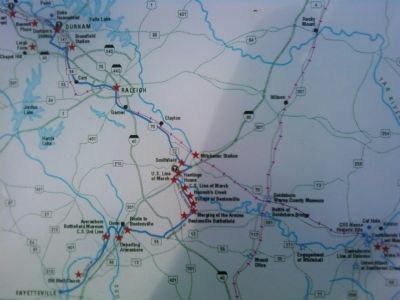 detail of map showing the NC CW Trails sites between Raleigh-Durham and Dunn. Credits. This page was last revised on June 16, 2016. This page originally submitted on April 26, 2011, by Lee Hattabaugh of Capshaw, Alabama. This page has been viewed 491 times since then and 9 times this year. Photos: 1, 2, 3. submitted on April 26, 2011, by Lee Hattabaugh of Capshaw, Alabama. • Craig Swain was the editor who published this page.